Pave Diamond Bangle. Pave Diamond Jewelry. Pave Diamond Bead Ball. Polki Diamond Bangle. Diamond Wedding Bangle. Rose Cut Diamond Bead. Wide Cuff Bangle. Fusion Gold Earrings. Australian Lemon Chrysoprase Vintage 925 Sterling Silver Jewelry Earring 1.42"
Main Stone : Lemon Chrysoprase. Main Stone Creation : Natural. All our jewelry is 100% natural conflict free. Material : Gemstone. Weight : 27.5CTS. New ListingAustralian Lemon Chrysoprase Vintage 925 sterling silver Earring 1.42"
Main Stone : Lemon Chrysoprase. Main Stone Creation : Natural. Material : Gemstone. Weight : 28CTS. Occasion : Special Occasion. Australian Lemon Chrysoprase Vintage 925 sterling silver Earring 1.22"
Main Stone : Lemon Chrysoprase. Main Stone Creation : Natural. Material : Gemstone. Weight : 31CTS. All our jewelry is 100% natural conflict free. Australian Lemon Chrysoprase Oxidize 925 Sterling Silver Jewelry Earring 1.73"
Main Stone : Lemon Chrysoprase. Main Stone Creation : Natural. All our jewelry is 100% natural conflict free. Main Stone Shape : As Seen In Picture. Main Stone Color : Multi Color. Material : Gemstone. THERE ARE ONLY ONE OF THESE EARRING PAIRS AVAILABLE!! This is an Incredible 10x8 Faceted Apple Green Chrysoprase Gemstone Sterling Silver Casted Earrings. JUST BEAUTIFUL! I don't expect this piece of jewelry to last long - SO GET YOUR PURCHASE IN TODAY!!!! SAVE OVER HIGH MARGIN JEWELRY STORES AND SO CALLED "DISCOUNTERS"!!!! EBS8174 !!. JEWEL OF INDIA. We are very fair and easy to deal with. Pave Diamond Bangle. Polki Diamond Bangle. Diamond Wedding Bangle. Designer Gemstone Earrings. Diamond Clasp and Lock. Carved Gemstone Pendant. Rose Cut Diamond Bead. Pave Diamond Bead Ball. Gemstone - Pink Opal & Chrysoprase. 14K Gold Wt. Gemstone Wt. Bracelet Earrings Pendant Necklace Bangles. Diamond Wt. We're not happy unless you are! 925 Silver Wt. Wishing you Best Buying.Experience. 18kt Solid Yellow Gold Chrysoprase Turquoise Dangle Drop Earrings New Arrival !! In case you need any clarification or information about any of our products, pls. We shall get back to you within 24-48 hrs. -Joyaassilver Jewelry is Handmade Designer Jewelry. 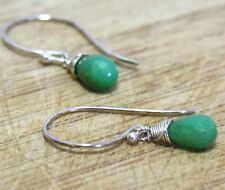 Australian Lemon Chrysoprase Silver Handmade Jewelry Earring 1.3"
About Earrings :-. This is an authentic Unique Earrings.You will receive a Earrings as shown in picture. Color:- Green. Kindly don't falter to reach us for any reason. We will do our best resolve your issues. Main-Stone : Lemon Chrysoprase. Material : Stone. Total-weight-of-Jewelry : 10.7 grams. Australian Lemon Chrysoprase Vintage 925 sterling silver Earring 2.17"
Main Stone : Lemon Chrysoprase. Main Stone Creation : Natural. Material : Gemstone. Weight : 41CTS. All our jewelry is 100% natural conflict free. Main Stone : Lemon Chrysoprase. Main Stone Creation : Natural. Material : Gemstone. Weight : 40.5CTS. All our jewelry is 100% natural conflict free. Australian Lemon Chrysoprase 925 Sterling Silver Earring 1.58"
Main-Stone : Lemon Chrysoprase. Material : Stone. Total-weight-of-Jewelry : 8.5 grams. Australian Lemon Chrysoprase 925 sterling silver Handmade Jewelry Earring 1.38"
Main Stone : Lemon Chrysoprase. Main Stone Creation : Natural. All our jewelry is 100% natural conflict free. Material : Gemstone. Weight : 29.4CTS. Pave Diamond Bangle. Polki Diamond Bangle. Diamond Wedding Bangle. Rose Cut Diamond Bead. Pave Diamond Bead Ball. Wide Cuff Bangle. Diamond Feather Jewelry. Pave Diamond Jewelry. Wonderful Natural Green Chrysoprase Faceted Teardrop Dangle Fish Hook Earrings crafted in Sterling Silver(solid, not plated). Crafted in the USA. Australian Lemon Chrysoprase,Green Amethyst 925 sterling silver Earring 1.77"
Main Stone : Lemon Chrysoprase. Main Stone Creation : Natural. Material : Gemstone. Weight : 51.55CTS. Occasion : Special Occasion. Australian Lemon Chrysoprase, Peridot 925 sterling silver Handmade Earring 1.77"
Main Stone : Lemon Chrysoprase. Main Stone Creation : Natural. Material : Gemstone. Weight : 34.5CTS. Pave Diamond Bangle. Polki Diamond Bangle. Diamond Wedding Bangle. 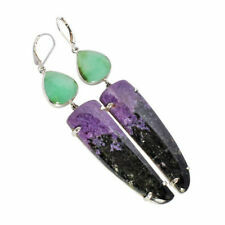 Designer Gemstone Earrings. 925 Sterling Silver Jewelry. Carved Gemstone Pendant. Pave Diamond Bead Ball. Rose Cut Diamond Bead. Lemon Chrysoprase Gemstone Handmade Ethnic .925 Silver Earring 1.3"
Main-Stone : Lemon Chrysoprase. Material : Stone. Total-weight-of-Jewelry : 8.7 grams. Main-Stone : Lemon Chrysoprase. Material : Stone. International - 1st Item 14.99 - Each Addtional Item 2.99. Main-Stone : Lemon Chrysoprase. Material : Stone. Polki Diamond Bangle. Indian Ethnic Necklace. Victorian Earrings. Rose Cut Diamond Bead. Fusion Gold Earrings. Diamond Clasp and Lock. Diamond Feather Jewelry. Sapphire Jewelry. Main-Stone : Lemon Chrysoprase. Material : Stone. Total-weight-of-Jewelry : 9 grams. New ListingAustralian Lemon Chrysoprase 925 Sterling Silver Earring 1.6"
Main-Stone : Lemon Chrysoprase. Material : Stone. Total-weight-of-Jewelry : 10.3 grams. Main-Stone : Lemon Chrysoprase. Secondary-Stones : Lemon Topaz. Material : Stone. International - 1st Item 14.99 - Each Addtional Item 2.99. Fusion Gold Earrings. Sapphire Jewelry. Designer Gemstone Earrings. Victorian Earrings. Pave Diamond Jewelry. Natural Ruby Jewelry. Mother of Pearl Pave Diamond Blue Sapphire 18k White Gold Dangle Earrings.